It looks like a sequel to Cheek To Cheek is on the way. Lady Gaga and the legendary Tony Bennett dominated the charts with their collaborative jazz album in 2014. After topping the Billboard 200 they picked up a Grammy in the Best Traditional Pop Vocal Album category and embarked upon a joint tour in 2015. Now it looks as though the pair are getting ready to replicate the feat. Yesterday (May 28), they linked up at New York City’s Electric Lady Studio. Photos emerged online, sending fans into a frenzy as they speculated what was going on. Although it is unclear what they were working on, it seems safe to assume that some sort of collaboration is on the way. Gaga’s expected return to jazz is another exciting project to look forward to. The second half of 2018 is shaping up to be action packed for the superstar. She is set to contribute new music and appear on the big screen alongside Bradley Cooper in a remake of A Star Is Born. The project is scheduled to drop in October. After wrapping up promotion on the film, she will launch her Las Vegas residency in December. She is also putting in work on another solo studio album. We don’t know much about the project just yet. However, it seems like the siren is aiming to return to her pop roots after dabbling in Americana on 2016’s Joanne. She has already reunited with BloodPop (Joanne) and DJ White Shadow (“Born This Way,” “Applause” and “The Cure”) in the studio. German producer Boys Noize signed on for the project and allegedly delivered “beautiful weirdness” in their session together. Also keep an eye peeled for a potential Katy Perry duet. The Witness diva listed Mother Monster as a dream collaborator during an interview on American Idol this spring. 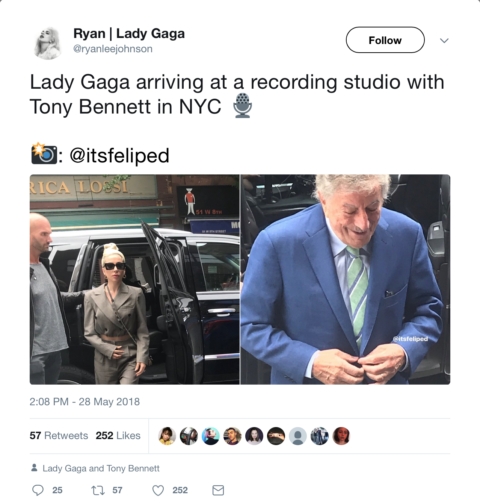 Reuniting with Tony Bennett only adds to the excitement and makes it clear Gaga is gunning for a massive return to the scene. Check out the evidence below! Are you ready for more jazz from Gaga? Let us know below, or by hitting us up on Facebook and Twitter!